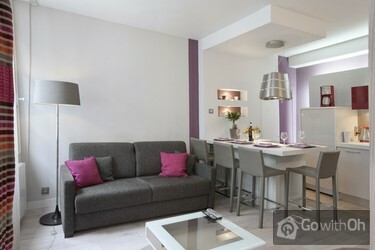 This airy Paris apartment vacation rental has a beautiful view onto a street and a modern style decoration. You will enter past large cupboards for storage into a cozy living room with a double sofa bed (140x190) and a welcoming dining area. If you enjoy cooking, the well-appointed designer kitchen with high-end components will delight you. There is also a nice bedroom with a double bed (160x200) and a bathroom which has a rain shower effect. 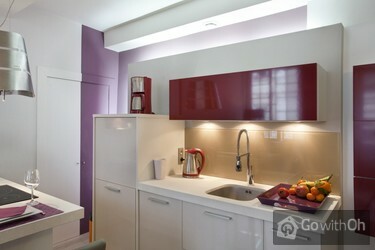 The holiday flat is located in Paris, in the center of the Latin Quarter, near the Seine and the Cathedral Notre Dame. You can walk to many sites of interest such as the Louvre, the Marais or the Pompidou Centre. Approximately 100m away you will have the Metro Saint-Michel, on line 4 and Saint Michel-Notre Dame, with the RER B and C, which will take you to the airports but also to Versailles. You'll have no trouble finding a multitude of shops, cafes, cozy pubs and restaurants for a typically Parisian experience on the apartment doorstep. O apartamento é muito bom, com equipamentos modernos e em perfeita condiçao de uso, exatamente como oferecido na página de internet. A localizaçao é excelente, a poucos metros do metrô, de restaurantes, etc. O único ponto negativo é que o apartamento está no terceiro andar do prédio, nao contando com elevador . tres bien et en principe au calme sauf que la poubelle passe a 6h00 du matin tous les jours! L'appartamento è veramente bello, ristrutturato da poco, accogliente e dotato di tutto. La posizione è eccellente, vicinissimo a Notre Dame in una stradina abbastanza tranquilla. The apartment is very well appointed and had all the creature comforts we needed for a week long stay. A fabulous location on the left bank. The owner and their agent was very pleasant to deal with making us feel welcome after a long flight. The all apartment reservation center were also very ...helpful and kind. I would definitely stay there again and also highly recommend it to others. Die Wohnung war grundsätzlich gut, es gab nur kleine Probleme mit der Elektrik. Manche Steckdosen haben nicht funktioniert. Ansonsten sehr gute Lage und eine sehr nette Kontaktperson. The apartment is modern, classic and functional. Simple and lovely. Everything inside was working perfectly and was easy to use. We think the apartment is really well equipped. The contact person could not meet us at the time we arranged before as our flight was delayed. Later on we had ...problems to find him to get into the apartment. He was busy with some other work and it wasn't easy finding him. Things worked out finally without great obstacles. This flat is great and looks just like the picture. It was very clean and all amenities are of high quality. The location is perfectly central. It is very easy to get to and, from there, you can easily get to any attraction by foot or metro. Our only complaint is that, because of the great, ...lively location, the apartment is quite loud. It is also very bright given all the local commotion. If the owners could add some heavy curtains to block out the light and some of the noise, that would greatly improve the flat. l'alloggio era come le nostre aspettative, discretamente pulito , accogliente e ben attrezzato (un po' sporco il coprimaterasso dei letti)!! purtroppo però piuttosto rumoroso durante la notte, questo forse anche a causa dei serramente piuttosto vecchiotti ma è da tenere in cosideraizine visto che... è situato in centro. La posizione eccellente per raggiungere tramite metro tutte le destinazioni turistiche. Cordialissima anche la persona di contatto che ci ha accolte nell'alloggio. Please remember that if you require assistance before your stay you will need to inform the property owner or the Customer Service department who are open every day from 11am until 8pm. Die Wohnungseinrichtung war sehr schön und die Lage sehr zentral. Allerdings war in der Beschreibung nicht erwähnt, dass durch die umliegende Gastronomie eine gravierende Lärmbelästigung bis tief in die Nacht vorherrscht. We thoroughly enjoyed our stay - it was so central to transport links, tourist spots, cafes and restaurants. The apartment was clean and comfortable and provided everything we needed for our two week stay. Thank you T&Jfor your friendly assistance. 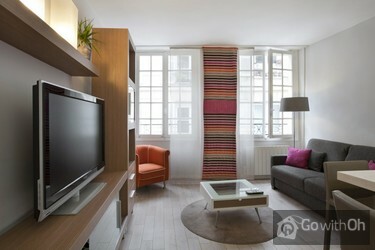 We highly recommend this apartment to anyone planning to stay in the St Germaine area. Such an awesome apartment and could not ask for a better position. Both Tand J were both fantastic to deal with and very helpful. Would love to stay here again one day in the future. LOVE PARIS!!!!! On arrival flat hadn't been cleaned, but was very quickly fixed by T. whilst we went out for evening dinner. On our return there was a note of apology, bottle of champagne and flowers. Very nice touch. WiFi wasn't functioning but all it needed, after chatting with T., was a re-boot, so quickly fixed. Gerne wieder, auch wenn im Viertel die Stadt nicht schlafen möchte. The accommodation was excellent. Fantastic location. The apartment was clean and comfortable. No lift, so be mindful if you have a lot of heavy luggage quite a few stairs to climb. Even though we loved the convenience of the location, if you are a light sleeper you might find sleeping difficult. ...Very friendly staff. We would recommend the apartment to others. Fantastic, clean flat in a great location. Some may find it a little noisy, particularly if staying over a Saturday night but it's a small price to pay for such a central location just a few minutes from the Seine and Notre Dame. Surrounded by cafes and bars you won't be short on dining options! Our... contact person N was fantastic and very friendly - arrived early to let us in and went through the flat with us in detail. 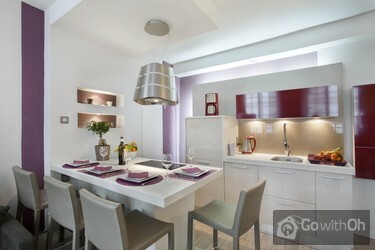 Lovely modern apartment with all facilities required. Fantastic location within walking distance to everything. 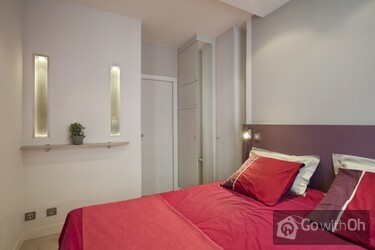 Loved the apartment - modern and right in the heart of the area. Loved the kitchen and being able to use a washing machine. Excellent area, lots of bars, restaurants and shops. Close to public transportation and taxi stand. Apartment was well furnished and comfortable with all of the amentities listed. It does get loud at night and the early morning hours due to the bar downstairs. Overall s great experience and would definitely recommend. Wer (wie wir) gerne im mitten im Zentrum ist, zu Fuß die wichtigen Plätzen und Museen erreichen will, ist in dieser Wohnung gut aufgehoben. Vom Flughafen super einfach zu erreichen mit RER bis St. Michel und dann nur um 2 Ecken herum. Die Wohnung ist für 2 Personen genial geeignet. Die Unterkunft... entspricht den Fotos auf der Webseite. Wir waren im Januar für eine Woche da. Die Wohnung ist gut zu heizen. WLAN vorhanden. Man kriegt dort keine Platzangst wie sonst in den Hotelzimmern, die meistens wirklich sehr klein sind. Die Küche haben wir kaum benutzt, weil rundherum viele Restaurants locken. Ein idealer Ort, um sich abends nach Museumsbesuchen zu entspannen und danach noch einmal loszugehen, um was zu erleben. Es kann nachts schon mal laut werden, uns hat es nicht gestört. Wir werden diese Wohnung wieder mieten. 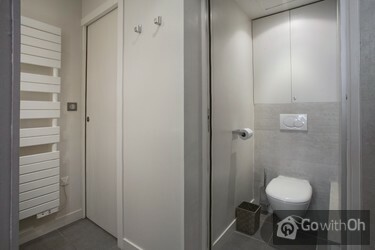 Au niveau du logement tout etait parfait, quelques petits details restent a etre ameliores: par exemple le lieu doit etre mieux nettoye et a fond (interieur des placards, poussiere par terre) il n'y avait pas du tout de papier toilette.... et comme il s'agit d'une rue brouillarde peut etre une ...isolation au niveaux des fenetres serait-elle la bienvenue. Ceci etant note la note globale est de 9,7 et on y reviendrait surement !! Location is excellent. Plenty of cafes, 2 min to trains, walking distance to plenty of attractions. It was a little noisy at night but that was a small trade off for the lovely apartment and great location. This was our first experience staying in an apartment, and we really enjoyed it. The apartment was very well located: one block from St. Michel square, near Notre Dame, near metro stops, many eateries nearby, however, this also made for noise both very late at night (singing in Irish bar below) and ...very early in the morning (garbage pickup). The apartment is on the 4th floor with a spiral staircase. It was clean, well-appointed, and perfectly adequate. We were able to get breakfast food or wine & cheese and have them in our apartment. Rue de Buci was a great road for bread, pastries,etc. Banana & Nutella crepes at the stand below the apartment were wonderful! Quería agradecerles y felicitarlos por el apartamento en París. Es realmente hermoso y está perfectamente ubicado! La pasamos genial junto a mi marido y mis hijasl! The apartment is in a great location - close to Notre Dame and Latin Qtr. We were there in May and when lots of tourists are in town, the noise mentioned by others wasn't bad at all and didn't bother us. The accommodations are good but if you are going to be sleeping on the foldout in the sitting ...room then bring eye masks to sleep as there is a great deal of light streaming in each morning! 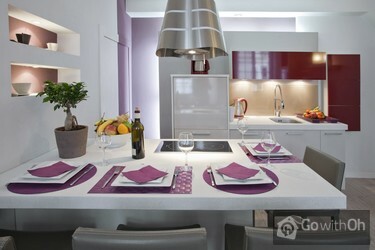 The apartment has everything you would need to prepare meals and eat in. A great money saver! The apartment was clean enough but could do with a really good professional clean e.g. the rug in the sitting room needed cleaning badly. The meeter, Charles was very accommodating as we had airline problems and this was dealt with easily and professionally. Very little to complain about and highly recommend! 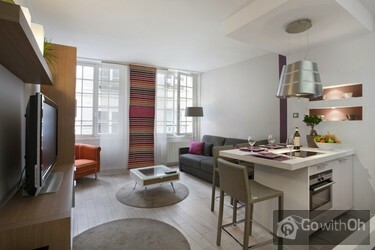 Best thing about this apartment - location, location and location, we found it very well located in the heart of Paris, very close to all the places we wanted to visit. The only negative comment is quite minor - some kitchen furniture requires to be repaired. Some people say the place is noisy (bar ...close to the apartment) but we found it reasonable and acceptable, would be surprising to live in a too quiet place close to the Latin Quarter! Durch das Pub nachts sehr laut! Im Schlafzimmer hing ein Vorhang halb herunter. Im Wohnzimmer fehlte ein Vorhangteil. Eine Bettlampe war defekt (Fassung abgebrochen) Ansonsten ertklassige Lage.. Wohnungsübergabe dauerte nach telefonischem Kontakt sehr lange. Übergabe und Einweisung verliefen sehr schnell und oberflächlich. la posizione dell'appartamento é fantastica. Chiaramente se si cerca silenzio si deve optare per un altro luogo ma noi ce la siamo proprio goduta questa vacanza con la Senna e Notre Dame a due passi, ristoranti, bar di ogni tipo e le Metro comodissime. Grazie Parigi!! 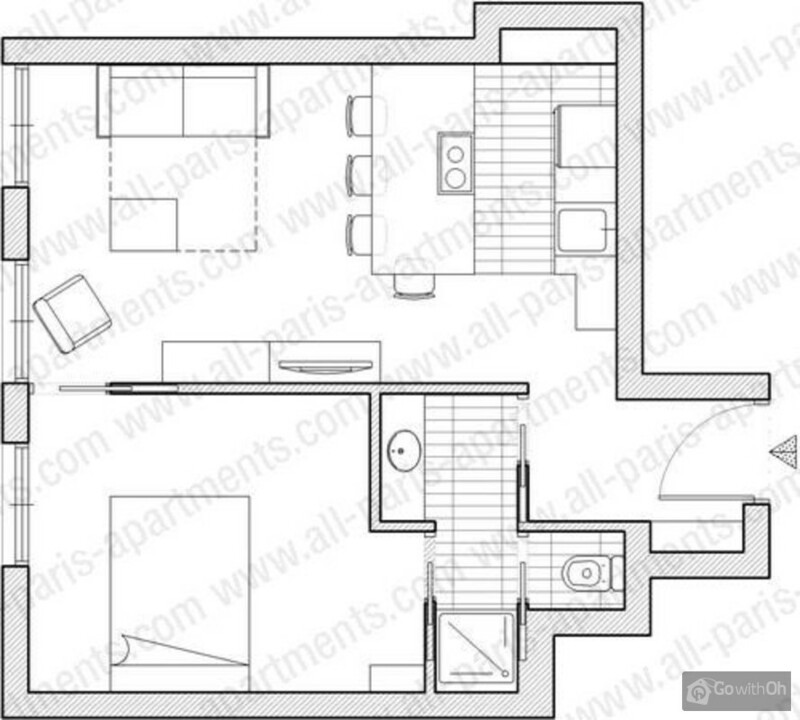 The apartment was fabulous, quite large for Paris, with everything you could want in it. The only downfall was that our representative was hours late, & we couldn't get a hold of him or All Paris Apartments. We were stuck outside on the street after nearly 38 hours travelling. Not a good start but all went well after that. Dear Client, we thank you and value your comments. We regret that you encountered problems to get in contact with us. We confirm that our Customer Care department is available every day of the year from 11h to 20h (CET). Keine Rückmeldung von Charles auf Anfragen per Telefon und SMS. kein WLAN, Herd nicht bedienbar, Mängel von Vornutzern nicht beseitigt (Steckdose und Licht im Bad defekt, Gardine fehlt), Toilette nicht für Ältere und Korpulentere geeignet. Sehr geehrter Gast, Vielen Dank für Ihr Feedback. Hiermit informieren wir Sie, dass die check-ins nun von einer anderen Person durchgeführt werden, wir bedauern die Unannehmlichkeiten, die bei Ihrer Ankunft verursacht wurden. Zudem bestätigen wir Ihnen, dass auch das Problem mit dem Strom und den Vorhängen im Dezember 2012 beseitigt wurden, und inzwischen auch Läden angebracht wurden. Die Internet-Verbindung wurde überprüft und sie funktioniert ordnungsgemäß. Perfekte Lage modernes zweckmäßiges Appmt. Alles Top! Extremely noisy location next to a bar that seems to never close. Loud party noises. Room lights were burnt out. Kitchen cupboard doors would not close. Carpets were filthy...I wish I could share the photos of the interior room problems...the pictures would say a million words. The person who ...gave us our keys at the location was late, when he arrived he was flippant. He took our burnt out light bulbs vowing to return with new ones but never came back. We stayed for a week in the dark. The location is perfect for site seeing if you bring noise canceling head sets. A youth hostel might be a better choice at least the lights will work and the management might be more caring. Dear Client, we thank you for your comments. The property owner confirms having verified the state of the lights, which now work perfectly. We also confirm that in mid-December, 2013 they performed construction updates to improve the condition of the apartment. great location, close to everything you will want to see and do. Wifi a bit of a problem and a bit of general maintenance but nothing to stop you enjoying your stay. Be prepared for the stairs up though. 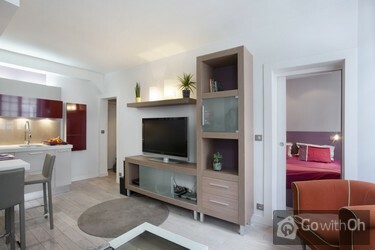 ottima ampiezza del soggiorno per il divano letto, ma soprattutto ottima posizione dell'appartamento nel centro di parigi. e comodo alla metropolitana e alla rer b, collegamento con aereoporto. Great location in the middle of everything...literally. Noisy bar with live music some nights but that is part of the experience. Our family of 4 stayed here for a week and were very cosy, good heating, reasonably-equipped kitchen (note: no basics like salt, toilet paper, dishwasher powder is ...supplied). Excellent secure entry via electronic tags and the 65 steps to the apartment are manageable if you're reasonably fit. Overall we would recommend for short stays. Dear Client, we thank you and value your comments. The property owner confirms that for each stay, he offers to all customers a welcome pack, which includes a roll of toilet paper and dish washer capsules. Das Apartment ist geschmackvoll, vollständig und funktional eingerichtet. Am Ankunftstag rannte eine Maus durch die Wohnung. Schränke und Geschirr waren dreckig. In der Waschmaschine lagen noch fremde Socken. Die Dusche war stark verschimmelt.Nachdem wir die Zustände reklamiert haben, wurde vom ...Vermieter am nächsten Tag eine elektronische Mäusefalle aufgestellt und die Dusche mit einem Reinigungsmittel speziell gegen Schimmel behandelt. Nice and close to where we wanted to be, great central location. Die Wohnung war sehr gut gepflegt, hatte ausreichend Platz und wir haben uns total wohl gefühlt. Allerdings brauchten wir 20 Minuten, um den Herd in Gange zu bringen, da es sich um einen Induktionsherd handelt und keine Gebrauchsanweisung dafür vorhanden war. Die könnte gern in das Büchlein mit ...den anderen Gebrauchsanweisungen hinzugefügt werden. Zentraler kann man in Paris nicht wohnen, auch wenn es ein wenig laut war - Paris feiert eben immer! Die Schlüsselübergabe lief reibungslos. SUPER! Moderne Wohnung in guter Lage. Nichts auszusetzen. Gran apartamento!!! Ubicación, equipamiento, diseño, comodidad, todo a favor. Puede mejorarse limpieza ropa de cama. Fuimos con niños de 8 y 3, encantados con todo, incluso con los 3 pisos. La zona muy bien comunicada, buenos servicios. Ambiente nocturno en fin de semana, el resto muy tranquilo. ...Una buena eleccion!!! A mejorar el proceso de check-in, el tiempo de espera algo largo, al viajar con niños se hizo eterno. Location very central to Paris. The Internet connection down and consequently the TV didn't function. Posizione centrale, fantastica per scoprire Parigi; animata anche la sera e ricca di locali e gallerie d'arte. Gentile e disponibilissimo il nostro contatto. Appartamento studiato nei dettagli e godibilissimo anche in 4 persone. Consigliatissimo. Dear customer, we appreciate and value your feedback. The owner confirms that in May 2015 they replaced the shower door, which was broken and was the reason for the water leaking. They also confirm that they have replaced the TV and changed the internet provider, so that the internet connection now works correctly. Cher client, nous vous remercions pour vos commentaires, nous les avons bien pris en compte. Le propriétaire confirme avoir remplacé la télévision. It was a bit noisy in the morning due to garbage truck which comes every morning at 7 o'clock. Windows are in good condition, but it is just one glassed old design windows . If you are weak sleeper better to take earplugs. But it did not spoil the general impression about apartment. Apartment is ...excellent, beds are very comfortable, heating, coffee machine, all in excellent condition. Taxi to/from airport only 60 , but it is possible to use RER B, for  9.75. Only 1 minute to the subway/RER. All the main sights within walking distance. The location was excellent. 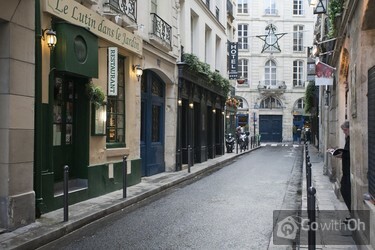 Great area of Paris and a short walk to the Metro. Comfortable apartment suitable for 2 adults and 2 young children (would be a squeeze with 4 adults). All facilities that you need including a washer/dryer. It took a while to get the wi-fi working, but it did work ...albeit a bit intermittently. The apartment is on the 4th floor, so quite a few steps that are very old. This was fine for us as it helped walk off all of the food we ate, but it would not suit if you were not fit and/or had a lot of luggage.There are a number of bars located in the area and it was noisy at night and the bins seemed to be emptied early every morning. This did not worry us, but it is might for light sleepers.Would definitely recommend and would love to stay there again. Dear customer, we appreciate and value your feedback. The owner confirms that they repaired the Internet in January, 2015 and that it now works correctly. It was lovely and we really enjoyed our stay here. Die Wohnung liegt wirklich sehr zentral. Man findet viele Ausgeh- und Essensmöglichkeiten. Die Wohnung ist schön eingerichtet und sauber. Das einzige was störend sein kann ist, dass die Fenster keine Dichtungen aufweisen und daher sehr hellhörig sind (morgendliche Müllabfuhr etc.). Die Wohnung ...liegt im 3. Stockwerk. Es hat kein Lift. Uns hat das aber alles nicht gross gestört. L'appartamento è in una posizione ottimale, in pieno centro e a pochi passi trovi davvero di tutto. Proprio per questo però è un pò rumoroso specialmente la notte dei week-end. La persona di contatto è stata gentilissima e a totale disposizione. L'unica nota negativa è stato uno sgradevole odore nel vano scale. Estuvimos en París del 19 al 26 de junio con nuestros hijos. Ya conocíamos París, así que ya sabíamos lo buena que era la situación. El apartamento está tal cual aparece en las fotos. Si es cierto que la calle es algo ruidosa por la noche, aunque a nosotros no nos molestó pero no tuvimos que... dormir con las ventanas abiertas. El trato con la propiedad fue perfecto, se pusieron en contacto con nosotros unos días antes para planificar la llegada y M fué muy amable al recibirnos y explicarnos todo. Volveríamos sin duda. The apartment was nice, clean and ok for four persons. Se recomienda cilocar airte acondicionado y unos abanicos de piso o techo. Pero en general demasiado bueno !!! We loved our stay here, the owner was very helpful, the apartment clean and comfortable. We'd definitely come back. Wir waren schon öfter in der Wohnung und es war wie immer alles sehr gut! Sehr engagierte Kontaktperson! Die Wohnung ist für 2 Gäste perfekt. Die Lage neben dem Place St. Michel ist ideal, um weite Teile von Paris zu Fuß zu erobern, aber auch 2 Metro-Stationen (Linie 4 u. 10) in unmittelbarer Nähe. Am Abend steppt hier aber auch der Bär; geräuschempfindliche Gäste ...sollten besser in einer anderen Gegend absteigen. Uns hat das aber nicht gestört. Departamento limpio, comodo, con todos los utensillos de cocina necesarios. Buen wifi. Negativo: en las escaleras para llegar al departamento (67 escalones) hubo siempre olor desagradable. Eine sehr schöne und saubere Wohnung die wir jederzeit wieder buchen würden. El apartamento estaba como en las fotos .Muy bien situado y con equipamiento nuevo. Aunque en mi caso, tuve un accidente en las escaleras de acceso que son estrechas, poco iluminadas y eso me ocasiono graves problemas. Por lo demas, como apartamento perfecto. El acceso no tanto. knowing the area, we knew it wasn't going to be the quietest!That said, lovely clean apartment in the best area of Paris (in my opinion). Die Lage ist perfekt, und die Wohnung ist hübsch und funktionell eingerichtet. Wer absolute Ruhe sucht, ist hier allerdings nicht ganz richtig. This apartment was a lot bigger than we thought it was going to be. The host Y was super friendly and accommodating. The apartment is located in a fantastic area surrounded by many restaurants, bars and transportation. It's also walking distance to pretty much every tourist site in Paris (especially... if you love walking like us). The staircase up to the apartment is also much wider than ones that we have used in the past making it much easier to take your luggage up and down. 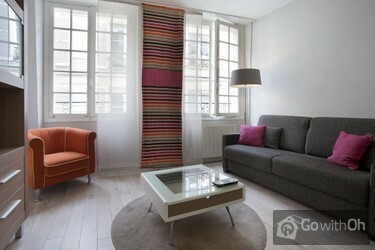 Overall, I highly recommend this apartment, its perfect for 2 adults who want to spend a while and live like Parisians. Will definitely stay there again!